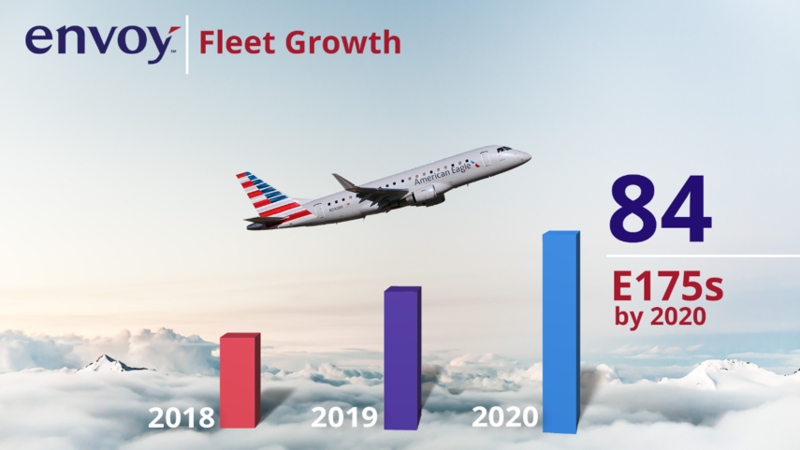 Great news for the Envoy team, as American Airlines announced that it is exercising options for 15 additional Embraer 175 (E175) aircraft and that they will be operated by Envoy. These new aircraft are expected to begin arriving at a rate of three per month, starting in early 2020. This is in addition to the 25 E175s currently on order that begin arriving later this month and continue through 2019. By mid-2020, Envoy’s E175 fleet will have nearly doubled to 84 jets from where it is today. In total, Envoy’s fleet numbers more than 170 aircraft, including over 100 44 and 50-seat Embraer regional jets. This new aircraft will position Envoy to continue growing and expanding its service to American. “Each new aircraft we welcome to the Envoy fleet represents more jobs and greater opportunity for all of us. We now have nearly 17,000 employees, flying to more than 150 destinations and providing ground handling in 112 airports – and today’s news ensures that we’ll continue to grow in the years ahead,” he concluded. Join the Envoy team and grow with us!